Linux started its life in the data center as a cheaper alternative to UNIX. At the time, UNIX operating systems ruled the industry and for good reason. They were performant, fault tolerant and extremely stable. They also were very expensive and ran on very proprietary hardware. A lot of the familiar utilities and applications developed for those UNIX platforms eventually were ported over to Linux. So, once Linux ran services like Apache, it came as no surprise that Linux would usurp and replace the very same technologies that once inspired its creation. The very best part was that Linux ran on commodity x86 hardware. At the end of the day, anyone could deploy a Linux server at a fraction of the cost to deploy something from Sun Microsystems, Silicon Graphics (SGI) or from any other UNIX distributor. Fast-forward to the present, and Linux continues to maintain a strong competitive lead over other server offerings, including the very popular Microsoft Windows. But why is that the case? In order to answer that question, one first must understand what Linux is. In short, Linux is a free and open-source UNIX-like kernel. It is licensed under the GNU General Public License version 2 (GPLv2). Initially released in 1991, Linus Torvalds continues to maintain the project. Early in its life, Linux was able to latch onto and make use of common GNU libraries and applications. This allowed the kernel not only to become more usable but also helped encourage more users to dabble with it and eventually contribute back to the project. As a result, the Linux project grew, and it grew fast. It continues to draw positive attention. Today, Linux is deployed in most data centers worldwide and manages some of the internet's most critical applications and services-- even powering what we commonly refer to as the cloud. A large number of companies trust Linux to maintain their workloads and do so with little to no interruptions or downtime. The kernel even has crept its way into our home entertainment systems, automobiles and mobile devices. Everywhere you look, there is Linux. What made Linux attractive, at least in the beginning, was its price. It is very difficult to compete with free. When Linus first announced his hobby of a project on a Minix newsgroup, it was to offer others another UNIX-like alternative-- one that ran on i386 architectures. At the time, the only other UNIX alternatives were BSD and Minix. What eventually helped keep the kernel's price tag low was its license. Many of the software projects surrounding the kernel also used the same or similar open-source licenses. This made distribution easy, as long as the distributor complied with all package licenses. To quote Eric S. Raymond and the definition of Linus' Law in his book The Cathedral and the Bazaar : "Given enough eyeballs, all bugs are shallow." As the project grew in lines of code, so did the number of developers and users touching it. These dedicated individuals spent countless hours discovering and immediately correcting bugs-- bugs that may have caused instability at one point in time or under extremely specific workloads. To date, the Linux kernel supports the most hardware architectures and hardware peripherals in the world of software development. Nowhere else will you find a kernel designed to run on multiple versions of 32- and 64-bit x86, ARM, MIPS, SPARC, POWER, microprocessors or even supporting the some of the hottest, most obscure or outdated hardware device. And, it does so from a single source tree. For the same reasons lending to its stability, Linux continues to be the most secure kernel currently running in production. When an exploit is discovered, it is immediately patched into the latest stable kernel and then backported to all affected Long Term Supported (LTS) kernels. Drawing additional inspiration from its UNIX predecessors, from the start, Linux was designed to be a multiuser operating system. This allowed for tighter permission and access controls to both users and applications. While not impossible, Linux has given would-be attackers less motivation to write viruses or malware for the platform. Another benefit to its open-source licensing, companies redistributing Linux can focus a majority share of their efforts to ensure that their customers receive nothing but first-in- class support. Unlike closed-source software vendors, Linux distributors have the privilege of leveraging the talents of many extremely intelligent developers and users across the entire globe to develop for and test their software-- most often, at no additional cost to them. While Linux and the operating systems using the kernel are free, supporting those operating systems typically requires companies and end users to pay for support subscriptions. This way, you are guaranteed to get the latest software technologies, hardware support and security patches integrated into your environment and onto your physical or virtual machines. If the points highlighted above don't convince you, consider the following. The latest and greatest software technologies debut themselves on Linux. Think of containers (Docker) and OpenStack. The first bleeding-edge piece of server or embedded hardware is initially written to support Linux. Think of Storage Class Memory (SCM) and the hottest new Intel or ARM microprocessors. This is why the folks over at IBM have committed themselves to providing their customers with the very best in Linux solutions. 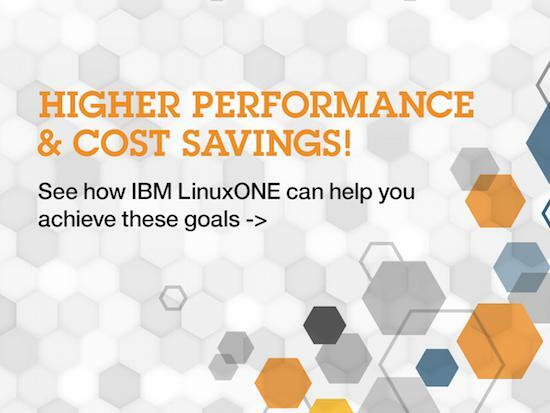 Through its unique hardware design, IBM has configured the LinuxONE to be extremely performant, secure, scalable and fault tolerant while also significantly driving down your Total Cost of Ownership (TCO) when compared to traditional x86 servers. It accomplishes all of this through consolidation. You can learn more about how the LinuxONE can help accelerate your business here: Why settle for anything less? Note: if you're interested in more information on LinuxONE and its advantages, check out the whitepaper "10 reasons LinuxONE is the best choice for Linux workloads".